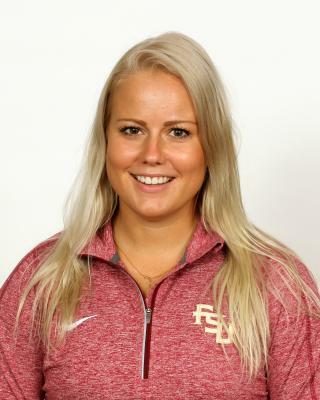 Senior Norwegian hammer thrower finished 19th in her second NCAA Championships appearance; first since 2014…won ACC Outdoor title with a lifetime-best mark, helping Noles to second team title of her career…has held the FSU record since the second meet of the 2014 season. Outdoor: Qualified sixth from the NCAA East Preliminary (59.51m/195-3)…won her first ACC title with three-year PB of 62.51m (205-1) on her opening attempt…has been picture of consistency all season with three runner-up finishes. Indoor: Competed in weight throw twice, with SB 15.85m (52-0) coming at ACC Indoor meet. Outdoor: Season highlight came in FSU Relays opener when she won with a new PB (61.39m/201-5) to break her own record…finished seventh at ACC Outdoor Championships…qualified for second consecutive NCAA East but did not advance. Indoor: Posted a new PB in the weight throw (16.91m/55-5.75) at Doc Hale Invitational; one of three meets over 16 meters. Outdoor: Qualified for NCAA Championships in first season, but failed to post a mark at Eugene…qualified sixth out of the East Preliminary (60.63m/198-11)…followed a fourth-place finish at the ACC Outdoor Championships with consecutive event wins…broke 15-year old FSU record in her second meet at the Crimson Tide Invitational with a mark of 59.08m (193-10)…improved on that record with a winning throw of 60.86 (199-8) at the Seminole Twilight before eclipsing the 200-foot barrier at Georgia Tech (60.99m/200-1). Indoor: Competed in the weight throw for the first time in two meets. posting a caree-best 15.46m (50-8.75) at the ACC Indoor Championships.